Coldwell Banker Evergreen Olympic Realty, Inc., shares local housing market update and forecast. Didn’t we all learn as children that it is rude to be late? Our parents and Mrs. Crabtree, our second grade teacher, who always taught us to be on time, will have to forgive us if we excuse our real estate market for being late. Back in 2006-2007 the Northwest real estate market was still climbing while the rest of the country was heading down. In this instance, being late gives all of us a big advantage. We get a chance to see what might be coming. When prices around the country were dropping from 2006-2011, a result of shrinking demand and too much building earlier last decade, many people put off otherwise desired moves. During this time relatively little new construction occurred, which allowed the excess inventory to be absorbed. In late 2010 and throughout 2011, prices got compelling and many parts of the country started to see year over year increases in home sales. Enough buyers re-entered the market to cause the supply-demand balance to dramatically shift. 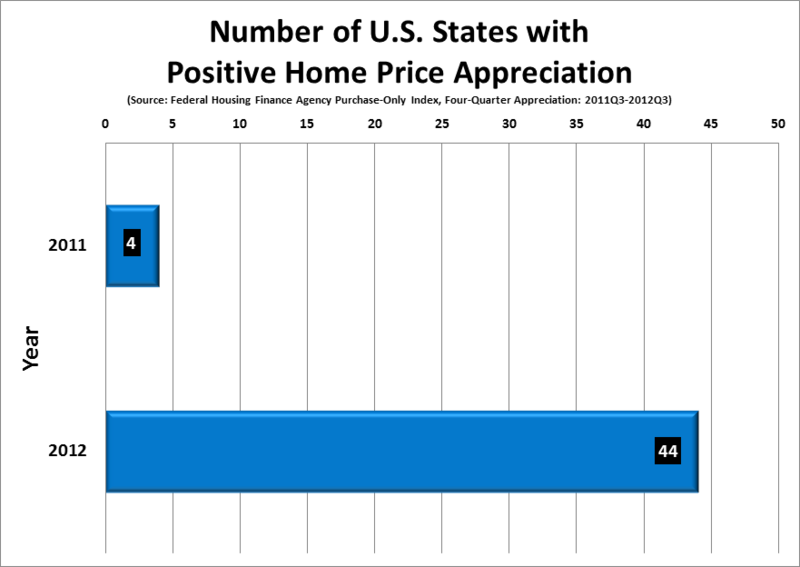 Despite these nice gains in the number of homes sold, only four states experienced price appreciation in 2011. This is a prime example that in real estate changes in price tend to lag sales by 18-24 months. After a couple of years of climbing sales, 44 states experienced price gains in 2012. (See Chart 1.) The U.S. as a whole saw 4.0% price appreciation. Washington State experienced a 3.7% gain. In many areas, the bounce was more significant: North Dakota up 9.2%; Nevada up 8.7%; Florida up 7.9%; and California up 7.2%. Closer to home, Thurston County lagged with a 0.7% drop in median home price. The difference is our pace of sales. Our sales did not begin to rise until the spring of 2011; and last year was the first since the peak of the market that we saw an annual increase in sales – up 8%. King County, by contrast, started to see gains in sales a full year ahead of our market. Those increases, coupled with a sizeable drop in homes for sale, had King County poised for price gains in 2012. Sure enough, by the end of last year, prices rose 7.4%. Everyone likes to buy at the bottom and few are lucky enough to do so. King County buyers who purchased over the past couple of years are smiling at the timing of their purchases. 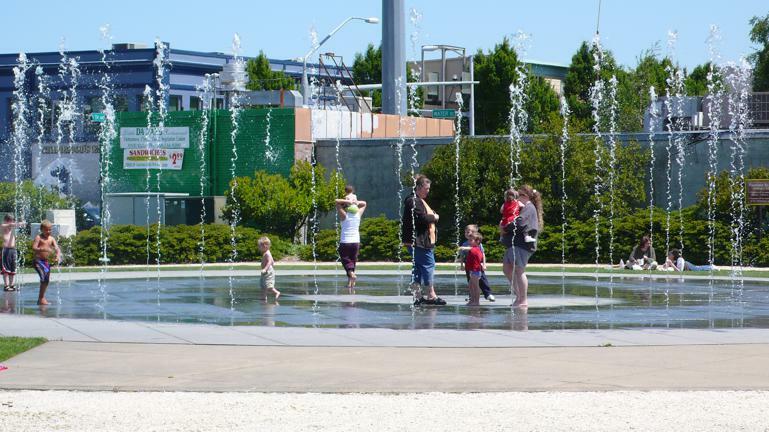 Now with a string of 20 months of increasing sales, combined with a 46% drop in the number of homes for sale, Thurston County has the same conditions that markets like King County saw before prices started to rise. But before we get too excited about prices roaring back, we have to point out some important contrasts. Our market did not climb as high as other places around the country, and we did not fall as steeply either. While our area has certainly been dealing with a large amount of oversupply during the past five years, the imbalance was not so great that it required the major fire-sale prices seen in many of these other markets. As a result, we forecast that prices here should see only modest gains over the next 12-24 months, perhaps in the 3-4% range. At best, we hope to return to the steady but not crazy gains long experienced prior to the heated market from 2004-2007. While we cannot predict with certainty where prices will go, being late to the correction is giving us invaluable insights into what might be in store. We expect that our buyers this year, as well as those who bought over the last couple of years, will be very pleased they purchased when they did. 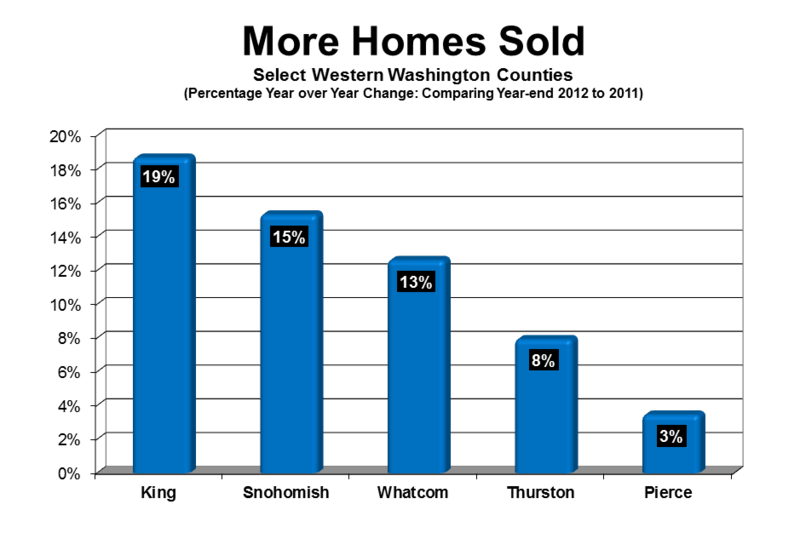 Statistics compiled in part from NWMLS data by Coldwell Banker Evergreen Olympic Realty. Statistics not published or provided by NWMLS.